Greenfield City, Sta. 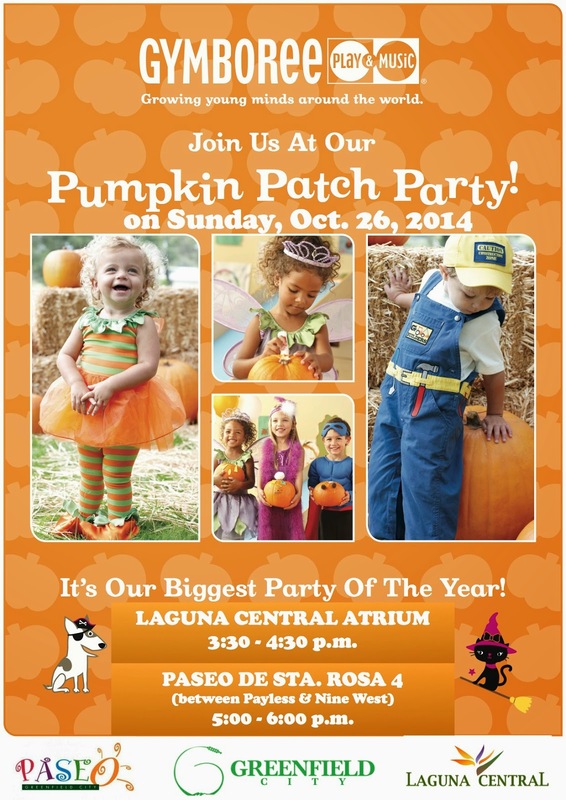 Rosa Laguna, hosts Children's Pumpkin Patch Craft, Parachute Event and Costume Parade. Featuring prizes for voted best costume! Prior to its grand launching in November 2014, Gymboree Sta. Rosa will give children 1-5 years old a taste of how fun Gymboree Play & Music is! October 26 (Sunday) Activities: Pumpkin Patch Halloween project, Costume Parade for kids and parents at Laguna Central and at Paseo de Sta. Rosa, Arts & Crafts, sing songs, participate in the "Parachute Time activity". Prizes will be given for kids with the best costumes! For further information about the event, visit www.gymboree-ph.com or call (049) 576-0595.